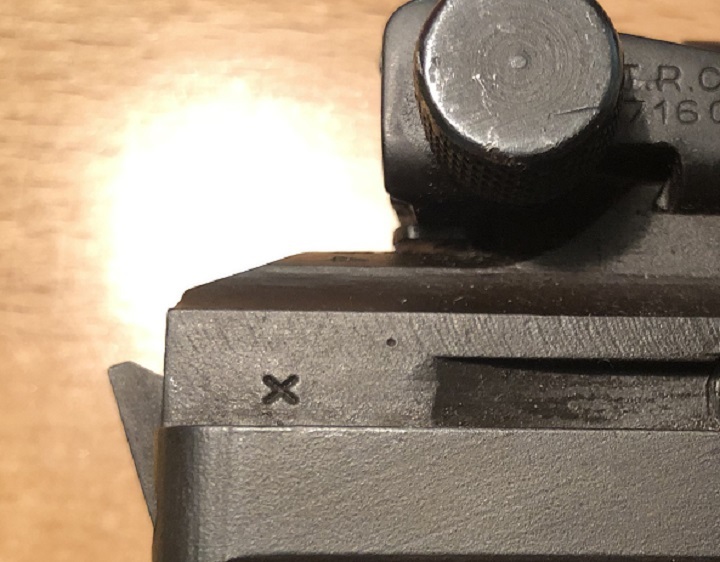 Hammer and rear sight markings? 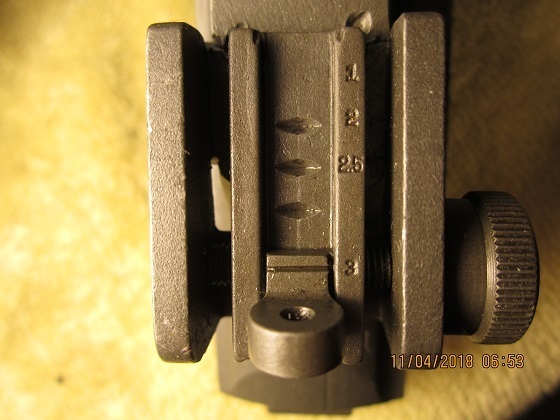 Quote Reply Topic: Hammer and rear sight markings? Seems like every new carbine I acquire has markings I can not find in my books or the newsletters. 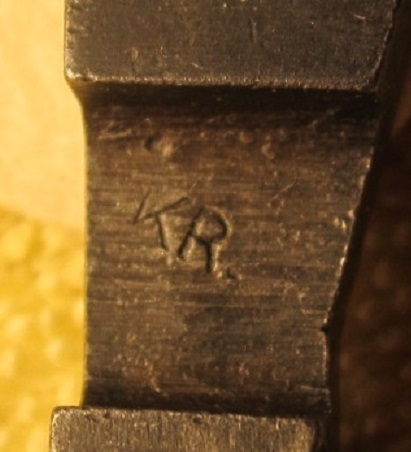 The hammer code is RK (as opposed to KR). 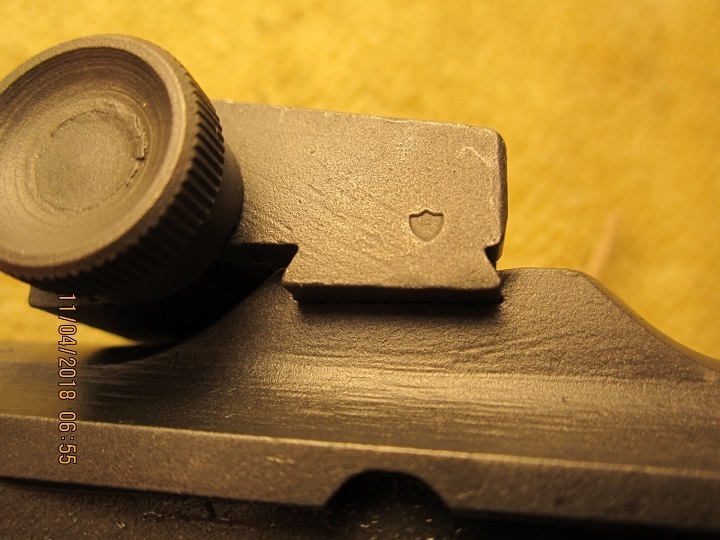 The rear sight only has a very small shield. Both came on a rebuild Rock Ola. "Rescuing one animal may not change the world, but for THAT animal, THEIR world is changed forever"
Hmm, that may be the smallest Hemphill mark I have seen but seem to remember there were two sizes or styles. K hammers were Kal tool. Some have been observed overstamped with an R like yours. Take a closer look at it. It was in the newsletter 139, 181 and think pictures later. What mark if any is on the other side? Edit to add: CCNL 365 talks about two different styles on the Hemphill stamped sights. Still looking on the mini mark on the milled. 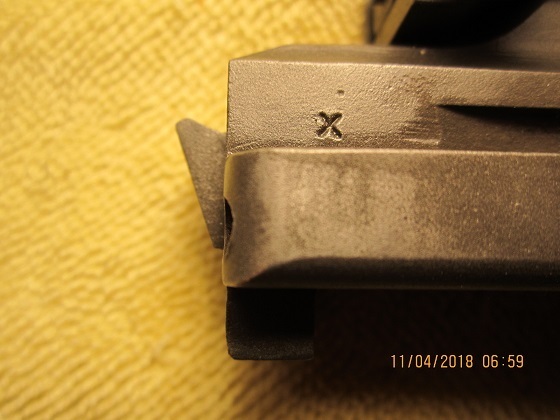 There is what ooks like an X on the right rear of the receiver. Here is more on the hammer, hemphill mark, and X on receiver. 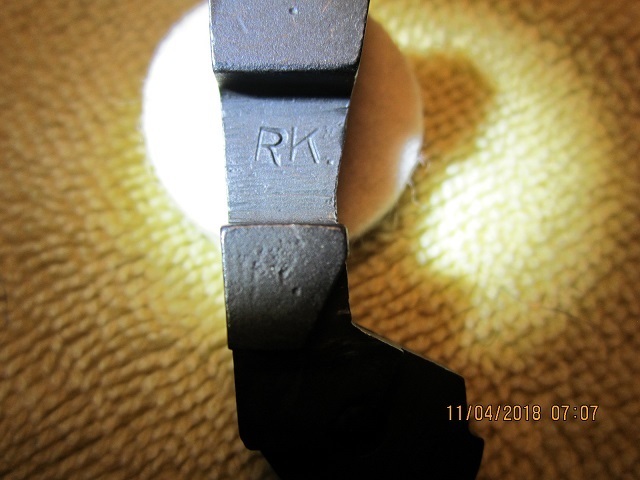 I reviewed all the NLs and milsurp post regarding K hammers. Thanks, Dan and Painter. I took more photos, different angles, different light, and can not make out any other underlying code that may have been stamped over. Except perhaps on the first pic, there might be a faint understamp beneath the two legs of the K but is questionable. Cannot see it in other pics. And YES, there is an X on the reverse side. So for now, I am considering this a legit Rock-Ola hammer. 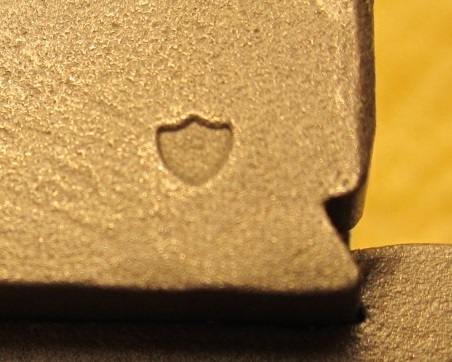 I can almost see an H inside the Hemphill shield, which is amazing since it is so small to begin with. Below these 2 pics is pic of the aperature marks. And finally, an X on the right rear of the receiver as m1a1fan noticed. One of the NLs said this most likely means that the receiver was removed from the production line for testing and then reinserted for the build. 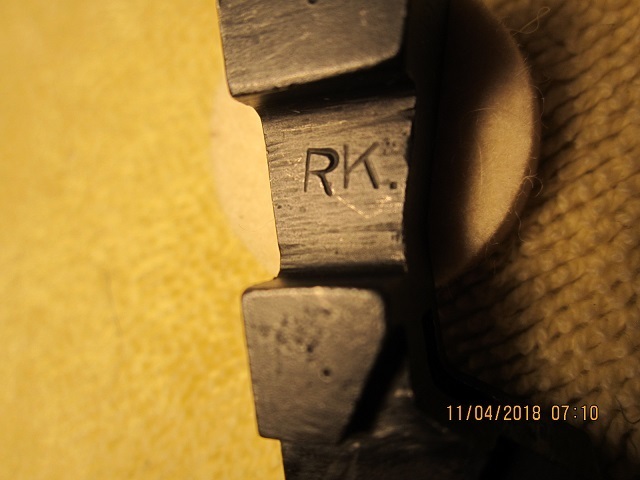 Kal hammers marked K.I. have been observed with other letters on the back side. o, O, S, X, T, as well as the number 3. If anyone has seen anything else please let me know. 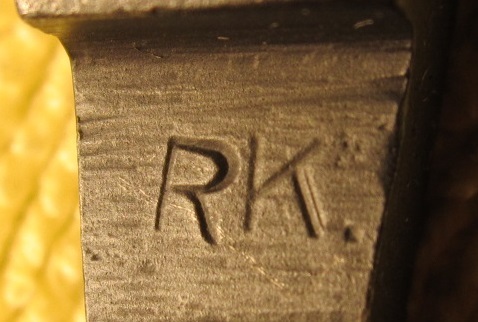 Normally we see a shadow of an I on the R overstamp ones. 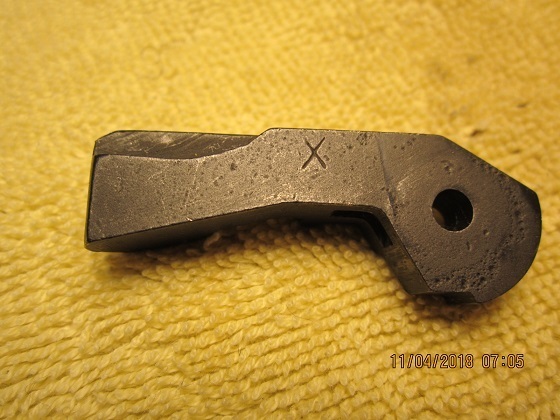 I have a Kal hammer just marked I. So far we have only seen the X on the R/K.I. Sometimes the R appears to have a broken leg. Again please report any variations. I am assuming that this Rock-ola is not a very late one and that the sight is not original due to the multiple stake marks. However, this may be a early style milled worth having a look into. 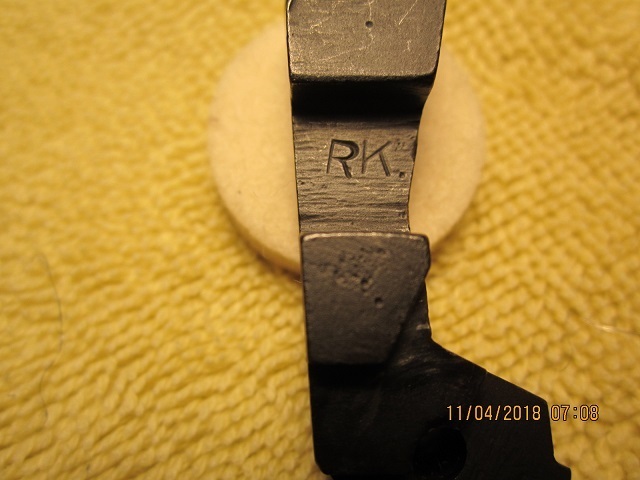 I have another hammer coded KR but it does not have an X on the opposite side. As for the rear adjustable site, it came off of Rock Ola SN 6.2M, and according to War Baby, is not the correct one for that SN. It should be a stamped sight. NL 117 did not differentiate machined vrs stamped. 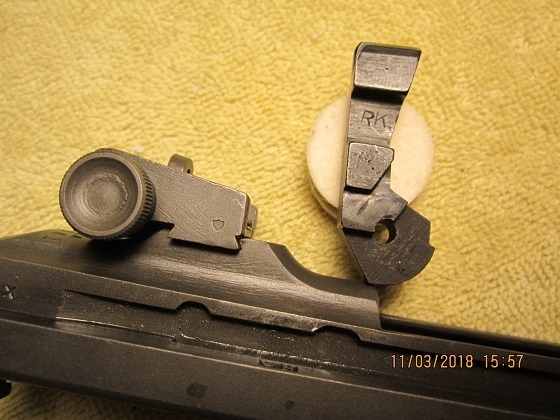 The carbine had some mixed parts so I an not considering this rear sight to be original. It seems to be the R/K.I. that have the X on back. K.I. has been observed with an X as well as others stated above. No reports I know of the smaller KR. having a letter on other side. Is the Rock-ola pictures above the 6.2? yep. All these photos from the 6.2M Rock Ola except the last photo of the KR hammer. Haven't seen one of these. Will keep my eye out. 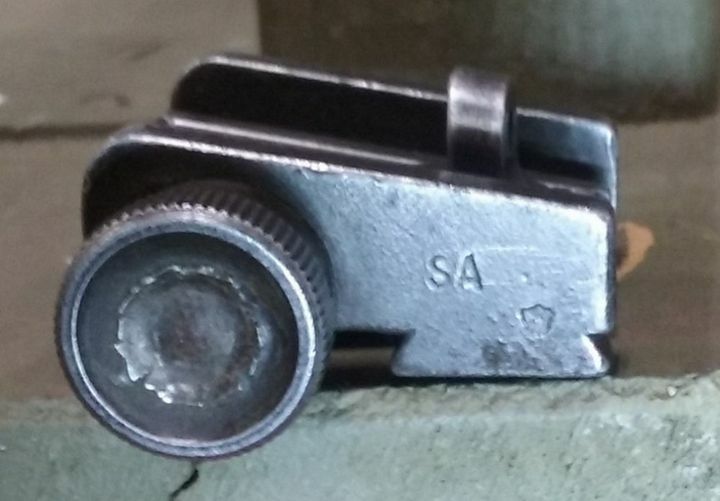 Both my type II SA rear sights are marked just like that. Can't find my type II 'Winchester' rear sights. I also have a type II with crossed cannons on left but no marking on the right side. Very recently picked up a Rock-Ola carbine, serial number 6210154. I had noticed the x at the rear of the receiver and wondered about it. Is there more discussion on this in another thread that someone could point me in the direction of? As I'd like to know more about it, but don't want to hijack the topic of discussion here. 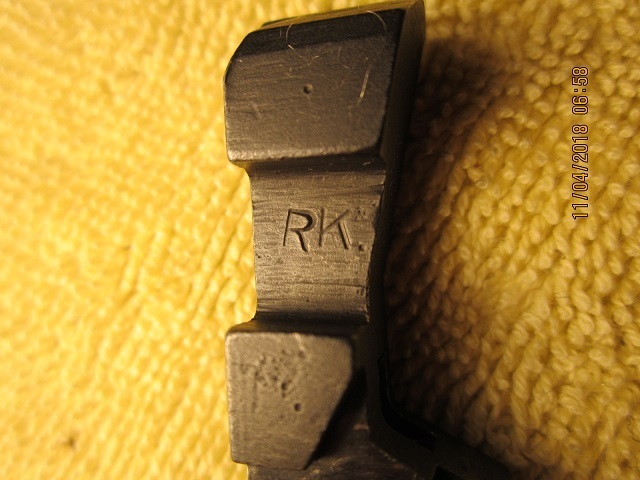 From page 398 of WAR BABY: "Various components (hammers, slides, barrels and receivers) manufactured by Rock-Ola throughout all of its four assigned SN blocks are sometimes found marked with a small x. These were taken at random during production from the assembly line, marked x for identification purposes, and used for quality control testing or experimentation. Components not damaged or destroyed in these tests were returned for acceptance, assembly and issue"